Dragon’s Domain Records, to be distributed through buysoundtrax.com, presents the soundtrack release of TREASURE OF THE YANKEE ZEPHYR, featuring music composed by Brian May (MAD MAX, ROAD GAMES, THE ROAD WARRIOR, CLOAK & DAGGER) for the 1981 action/adventure film directed by David Hemmings (BLOW-UP, THE SURVIVOR), written by Everett De Roche, produced by Antony I. Ginnane, starring Ken Wahl, Leslie Anne Warren, Donald Pleasence and George Peppard. Released in 1981, TREASURE OF THE YANKEE ZEPHYR, also known as RACE FOR THE YANKEE ZEPHYR was one of the most ambitious and expensive films in producer Antony I. Ginnane’s series of motion pictures that helped thrust Australia out of the regional folk adventure stories that had formerly typified its homegrown cinema into respected world class adventure, science fiction, and horror films and shared an equal part in resurrecting the country’s film industry. To score the film, Ginnane turned to composer Brian May with which he’d already established a creative relationship after hiring him for some of his other recent films such as PATRICK, THIRST, HARLEQUIN and THE SURVIVOR. 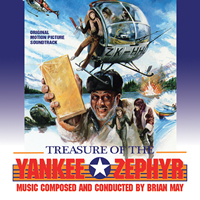 May’s music for the TREASURE OF THE YANKEE ZEPHYR focuses on energizing the action, reflecting and acknowledging the humor between the characters, and imitating their personalities in the midst of propulsive, exciting orchestrations for brass, string, and percussion during the lengthy chase scenes. Previously released on compact disc by 1M1 Records in the early 1990s, Dragon’s Domain Records is excited to bring TREASURE OF THE YANKEE ZEPHYR screaming back from the past, newly remastered by Digital Outland, including a special bonus track. Added to this album is a remix that loops the Main Title music, sans the comic segment that begins with the entrance of Barney’s wobbly helicopter, in order to present a fuller and purer version of the composer’s powerful main theme. The booklet includes exclusive liner notes written by author Randall Larson, with the participation of producer Antony I. Ginnane. TREASURE OF THE YANKEE ZEPHYR is a limited edition release of 1000 units.